You might say we went back to the drawing board to create this new feature coming in ProtoSphere 1.5.2. We're adding a set of drawing tools so you can annotate content on Presentation Boards. And by adding a blank side to your Presentation Board surface, you can create a white board for drawing flow charts or anything else you need to demonstrate. See it in action in the video I created here. 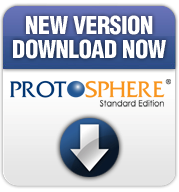 Presentation junkies, this one's for you: Laser pointers in our upcoming ProtoSphere 1.5.2. Now all users will be able to point to anything in their meeting room using ProtoSphere's new laser pointer. Just watch the eyes! See how it works in the feature peek video I recorded below. More ProtoSphere 1.5.2 feature peeks are on the way. You'll be able to try them all in our soon-to-be released ProtoSphere 1.5.2 demo build on our website. Next month I am Maryland-bound with two of our sales team members, John Reed and Tom Bevivino. We'll be exhibiting at the DIA Electronic Document Management Conference 2011 on Feb. 15-17 in National Harbor, just south of Washington, D.C. While we won't have the opportunity to test drive a Ferrari again like we did at WinConnections 2010 (sorry, Tom), we will be giving our booth visitors the chance to win something that's pretty cool in its own right -- an Xbox 360 Kinect gaming system. Microsoft is heading up the giveaway, and we're participating as one of the company's partners. So every attendee that comes to our booth, #309, can get a special stamped card to bring to Microsoft's booth at the show to enter for a chance to win the Xbox 360 Kinect. But that's not all we'll have at our booth. We'll also be demoing ProtoSphere Lync Edition, and highlighting the platform's SharePoint integration. You'll be able to see (and hear) first hand how ProtoSphere uses Lync's crystal-clear VoIP, and how you can share and work on your SharePoint documents right in ProtoSphere. You'll be able to take the demo home with you on one of the free USB flash drives we'll have available. The drive will also have some handy information on ProtoSphere too. And finally, if you'd like to just say hi, chat, or catch up, feel free to come on by too! If you haven't registered for DIA Electronic Document Management 2011, you can still do so on the show's website. See you there! As promised, here is the transcript from our recent webinar, which covered how life sciences professionals can use ProtoSphere and Lync together to improve collaboration. 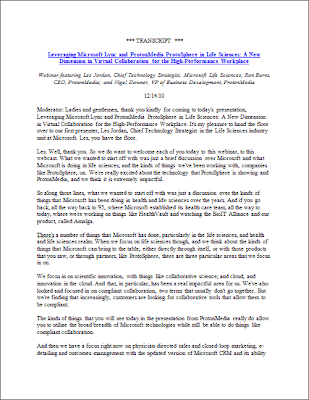 It's chock full of details on why we decided to integrate ProtoSphere with Lync in our new ProtoSphere Lync Edition 2010, and dives into the five key ways we're seeing life sciences professionals using ProtoSphere to improve productivity and knowledge sharing. Feel free to download, share, and read through it at your leisure. And as always, let us know if you have questions or feedback in the comments.